I don’t care too much for football, and I’m most certainly not an English nationalist, and yet I’ve got thoroughly caught up in, and even enjoyed watching England’s progress through this 2018 World Cup (England-Colombia accepted, at least until the very final kick of the ball). In this post I just present a few sociological musings on the World Cup 2018….. It strikes me that what I’m enjoying is not just the football, it’s the whole month-long media-spectacle surrounding the event: without the media-hype I just don’t think it would be the ‘World-Cup’…. I mean let’s face it, there’s at least 30 minutes ‘studio discussion’ before the group-stage games, and now England are the semi-finals, this pre-amble has increased to 90 minutes, not to mention all the coverage during the day, on T.V. and radio, not to mention social media. And of course, this year, the ‘youngster’s in the squad have upped the media-integration even more, with (well-managed) use of social media and goal-celebration dances taken from Fortnite…. Then of course there’s the inevitable celebrities and their ‘support messages’…as in this BBC 1 minute long trailer… I do wonder how many of these celebs even like football? In fairness, I do know that Russel Brand is a genuine ‘fan’ so fair play, he’s ‘earned’ his place in video, but the rest of the them… this might just be a vessel for self-promotion? The role of the BBC in constructing ‘World Cup Fever’ ? Is it just me, or is ITV coverage just a bit ‘wrong’? I don’t actually even regard ITV as a legitimate part of the process of World Cup construction… it’s more of a passenger IMO, it’s just not the same as the BBC. I mean Gary Lineker is about as ‘England in the World Cup’ as you can get (at least in the last three decades), and there’s no adverts, so you just get to soak up more the atmosphere, and it’s not just Garry: Breakfast Time does a pretty good job hyping up the event too. Would it even be a World Cup without Gary ‘crisp-muncher’ Lineker’? And yet it’s not quite hyperreality! For all the media-construction, and even talk of ‘hyping it up’, I can’t quite bring myself to call this a truly hyperreal event (as some postmodernists might argue) … because the games take place, well, in place, and there’s clear rules and a time-limit, and I can pop out there for myself if I want to!. 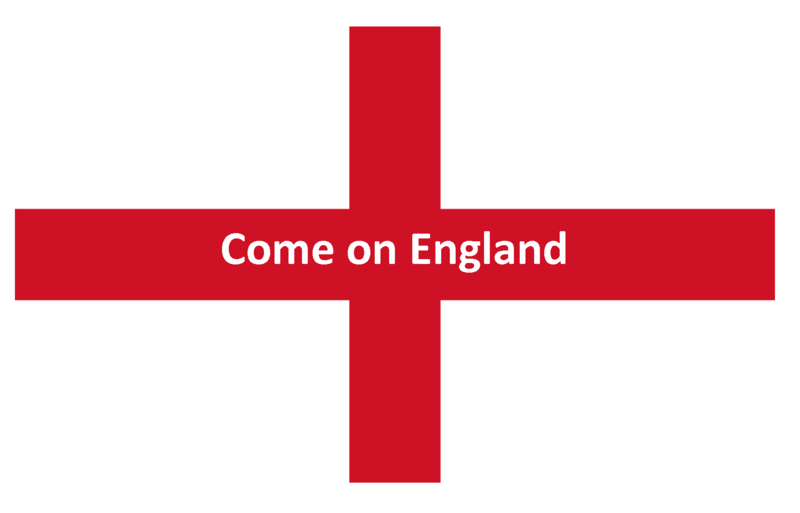 England in the World Cup: A ‘friendlier’ sort of nationalism? Of course the number of England flags draped out of people’s windows increases during the World Cup, as do the number of on-display beer-belly and football-tattoo combos, but this isn’t a small-minded, intolerant, closed kind of nationalism, it’s a ‘liminal’ type of sports-specific nationalism that’s maybe a little less angry and a little more vulnerable than your Brexit nationalism? I definitely think there’s something nationalist about the event: I mean being taken back through our nation’s footballing history is a mainstay of the narrative in the media-coverage, it’s even takes ‘solid form’ in our ex-England players fronting BBC’s coverage, and then of course… ‘football’s coming home’. OK, going down the home homeland route of analysis maybe a bit strong, but then again?! Certainly the way the World-Cup is constructed in the media, it’s a very inclusive, multicultural, open to all ages, and family-friendly event. A ‘soft-brexit’ kind of nationalism if you like, having said that, I’m sure there are plenty of places and pubs in the UK where those England flags and those tattoos are most definitely not expressing an open and tolerant idea of England! Anywhere, I’ll leave it there for today, just a few sociological ramblings….